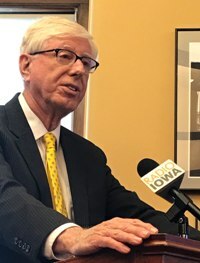 DES MOINES — Iowa Attorney General Tom Miller says the 215 attorneys, investigators and support staff in his agency are working under difficult circumstances due to spending constraints. Miller testified before legislators who draft the budget for the Iowa Department of Justice. Miller described the various restricted accounts his agency has tapped to make up for a 37 percent decrease in state taxpayer support of his agency over the past decade. Miller’s office fields consumer complaints. Prosecutors in Miller’s office were called in by county attorneys to handle more than 100 criminal cases in the past year, including 28 murder cases. In addition, Miller said there’s been a dramatic increase in the number of people convicted of a crime who appeal the judge’s or jury’s decision. Attorneys from Miller’s office also represent more than 200 state agencies, boards and commissions. Miller told legislators those lawyers are handling an increasing number of complicated employment cases. About 23 percent of the attorneys in Miller’s office work on child support cases.